Who doesn’t enjoy a good massage? It eases those nagging aches and pains, relaxing tense and tightened muscles and joints. Sometimes it may be hard to find the time or money to arrange an appointment with a massage therapist as often as you’d like. Rather than a pair of hands, a tennis ball may be used to massage your aching body. 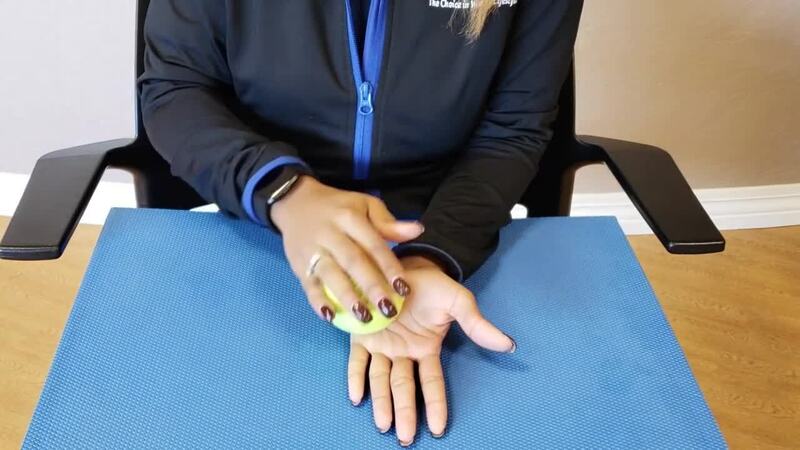 The tennis ball gets into those tight areas working into the deep layers of muscle and connective tissue, allowing your muscles to contract and stretch. Place ball at the palm of your hand. With the use of your free hand, massage the ball around the palm of the hand in a circular motion. Continue for 30 to 60 seconds. Roll the ball up and down each of the fingers, from the fingertip down to the base of the finger at the knuckle joint. Continue for 30 to 60 seconds. Repeat steps 2-3 with the opposite hand. Sit in a chair with feet flat on the ground and knees bent. Place the ball behind your bent knee and as close to the side of the knee as possible. Flex the knee with the tennis ball further, lifting the foot up from the ground. Hold the flexion and contract the muscles against the ball, squeezing the ball for 10 seconds. Relax your muscles for 10 seconds. Repeat 8-10 times, and then repeat on the other knee. Place two tennis balls inside a tube sock. Stand against a wall with feet placed about hip width apart. Place the tennis ball stuffed sock between you and the wall at the mid to upper back. Roll the balls up and down by flexing and extending the knees. Monique’s Expert Tip: Keep the ball to the left or right of your spinal cord to avoid injuring it. Sit in a chair, place the ball under the arch of your foot and press your bodyweight into the ball (as much as feels comfortable). Roll the ball from side to side, allowing the ball to move across your arch. Roll in this motion for 30 to 60 seconds. Roll the ball back and forth along the length of your foot, moving it from your heel to your toe. Roll in this motion for 30 to 60 seconds. Repeat steps 2-3 with the opposite foot. 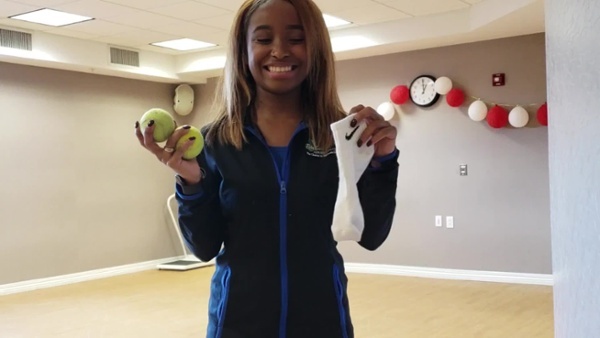 Monique’s Expert Tip: Be sure to focus on any specific tight spots and apply pressure into the ball to release tension in your muscles and connective tissue. To add additional pressure, use a wall or chair for support and perform the motions from a standing position. Monique is a Wellness Specialist and certified Arthritis Foundation Program Leader/Instructor. She designs workout routines and exercises that are personalized to your wellness goals. The Twin Lakes fitness center, The Connection, offers a variety of classes and equipment specifically designed for those aged 50+. The Aquatic Center includes a 75-foot heated pool, aquatic bikes, and a whirlpool. Our fitness center is open to the community and memberships are available. For more information on The Connection or Twin Lakes, contact us online or give us a call at 513-247-1300.